Songkran or Thai New Year is coming in a couple days. Besides all the major fun that is about to go on with the water fight, there are also some tips that have been given to the festival participants for their safety. The government prohibit people to use high-pressure water guns. I am happy to hear that you enjoyed my lessons. Yes, we also offer private Thai lessons via Skype. Our Skype lesson is the same as in-person lessons but through web camera, so you can start learning Thai right away from wherever you are! The materials are in Word and PDF files which are sent to students at the beginning of each lesson. We have been teaching students from around the World ; America, Europe, Australia, Asia over the years. From our experience we find that Skype lessons are as effective as in-person lessons. We usually suggest students to have lessons once or twice a week. It is sufficient to learn for one hour per session. Hello Mod! I’ve been following your blog and videos for a long time now. I’m really happy you always make such comprehensible videos. 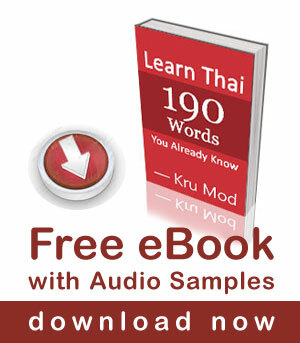 Although I’m half-Thai, I’m not proficient in Thai language, thus your lessons help me a lot. Have a happy Thai New Year too! Sawatdee ka Sirinya, thank you so much for your kind comments. I am very happy to hear that you found my lessons helpful. Hope you continue to follow my lessons un the future as well.